Rambler Pocitos i Montevideo, Uruguay : Boka nu! Very cosy hostel with nice and competent staff, all fluent in english. I visited during winter time and heating and hot-water wasn't a problem. It's close to a big mall which have everything you might possibly need. If you want to be comfortable, this is the place for you! 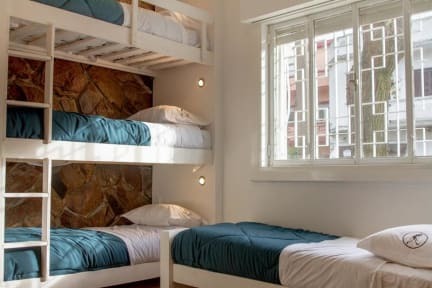 BEST hostel in montevideo! Superclean, close to everything and the staff is amazing (especially Lucas). They Will help you with everything and they're all superfriendly. Stay here if you want to feel like home!! Great hostel. Close to the beach and some good restaurants. Good service and clean rome. The only negative is that you have to pay with cash. When we were there the hostel was newly opened and it was very clean, with good showers and the staff was helpful. However it was rather empty so there was not much of an atmosphere. Breakfast is good compared to Argentinian standards because of the yogurt!